Eames' room is maybe my favorite, since we actually used a lot of color in here! 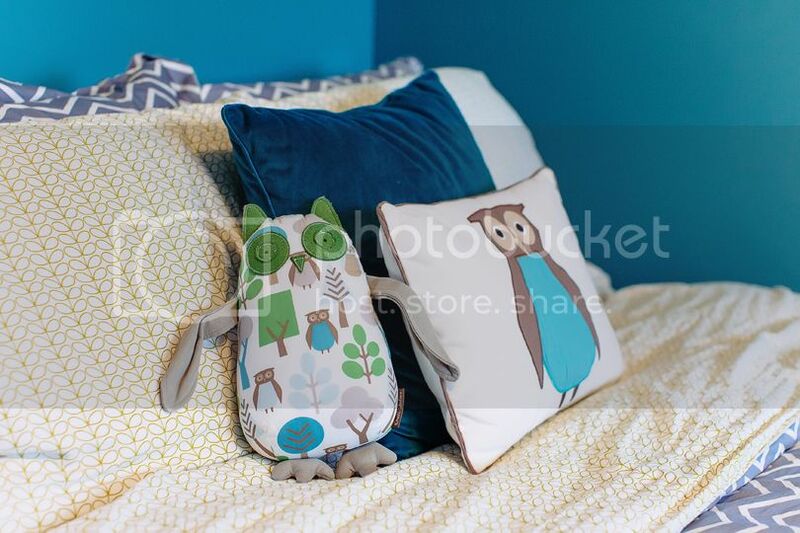 I took a cue from his nursery at our old house, and took the tealy-blue color that was in his Dwell Studio owl bedding for the walls. I LOVE this color in here, and with two windows, it's not too dark at all. We used a mixture of Jonathan Adler & Orla Kiely linens for his bed, which make it fun and playful. He obviously doesn't care what his room looks like, but I sure think it's a fun little boy room. His bed and dresser are from an estate of our friend's mom. She was getting rid of the set, and we snatched it up! It's a full sized bed, and he has two dressers, but we're only using one right now. The framed images of Eames at the hospital hung in his nursery at our old house, and I still like them in his room. I'm sure I'll updated this in the coming years, but for now, it's something! Kristen, the woman who took all the images of our house, actually was getting rid of this adorable bookcase before she moved to California, and she sold it to me for the same price she snapped it up for - $15!. It was a bit too tall, but we randomly found some shorter legs (on the side of the road...I am not joking...) that worked perfectly. Eames has all of this kid books in here, and I have a feeling this is the most abused piece of furniture in our home right now! I love the acorn mid century bed from west elm. Have thought about it myself (for down the road) but haven't seen one in the wild yet. Glad you're loving it. What a darling little boy's room. Lucky boy! Love those sheets!